When John Kidd sought permission to marry, he claimed that his first wife Fanny Taylor had died. The letter informing him of his wife's demise had been lost, but he was able to provide testimony by Ralph Mills Clarke, Tocal's overseer, that the letter existed. This cleared the way for John to wed Ann Maguire, a dairymaid who already had a daughter after she arrived in the colony. They married in Maitland in 1840. By then John had left Tocal to work for David Cohen & Co in Central Maitland, but in the next few years John worked on Cory Vale on the Paterson River and Melville on the Hunter River. In these years, two children were born to John and Anne. 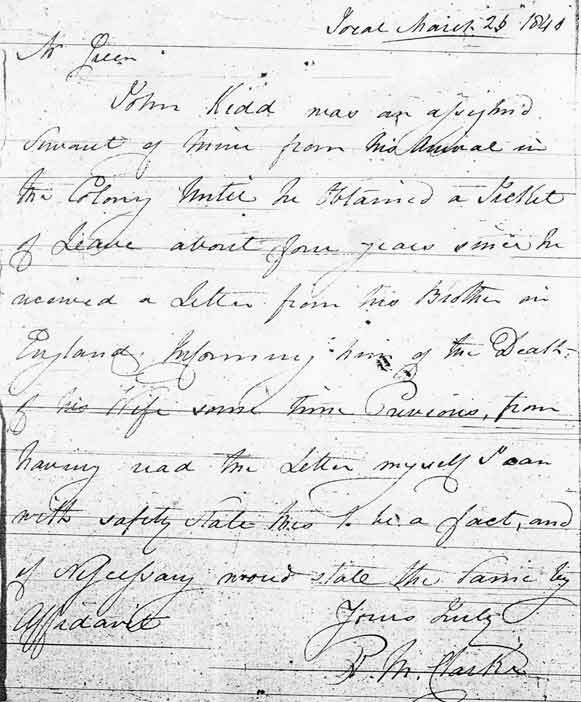 In 1844 John applied for a Conditional Pardon on recommendations of Felix Wilson, Charles Boydell of Camyr Allyn and the Police Magistrate of Paterson. This granted, he and his family moved to Marulan in the Southern Tablelands of NSW. This period is quite obscure - we don't know exactly where the family went, but three sons, John, William and James were born. James died aged 9 months in 1853 while they were still in the Goulburn district. Below: Letter from Ralph Mills Clarke stating that John Kidd's first wife was deceased.